The Wednesday Family Pasta for 4 special is a $20.00 savings off regular menu price! This is 4 adult portions of pasta (choose spaghetti, fettuccini, or rigatoni), this feeds more if you have children or seniors. It includes salad or soup, Italian bread, and 4 fountain sodas or tea. The Family Pasta for 4 Special is available every night for carryout, minus the drinks also. This is perfect for busy families who don't have time to prepare dinner, but still want something healthy and wholesome to eat. Luigi's is all about tradition and family. We hope Luigi's is part of your family tradition. Our customers tell us what they love about Luigi's is that it never changes. They love the consistency and quality we have tried to maintain for over 51 years. They like that their favorite dish is still on the menu after 30 years! In our ever changing world maybe it's nice to have something familiar and reassuring. 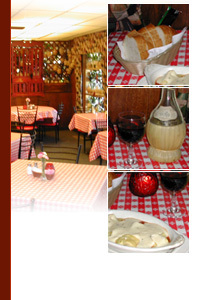 We hope that Luigi's is that comfortable place for you and your loved ones.